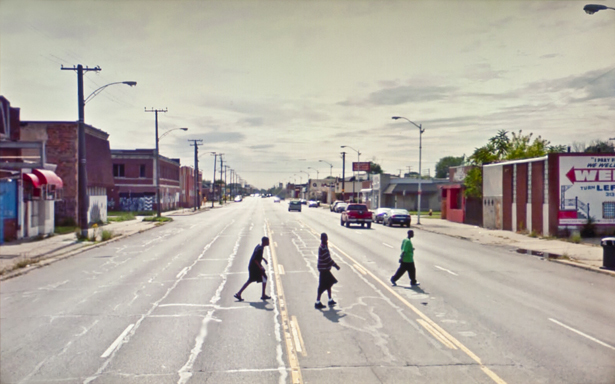 From inside a closed room, facing a computer screen, Doug Rickard snapped a shot of three black men striding across a wide street in Detroit. This picture originated not in the photographer’s mind’s eye, but in the targeted vision of the Google Street View camera. One can imagine a car-mounted GPS system and laser scanners zeroing in on the men as it passes, at once seemingly predatory and coldly dispassionate. Rickard selected the original photo from a huge pool of Google Street View images, re-photographed it using a digital camera, removed its Google logo, and elongated it into a panorama. It became part of Rickard’s photo series, A New American Picture, which has elicited praise from galleries and museum curators (a show of his works recently closed at the Yossi Milo Gallery in Chelsea; last year he was part of a MoMa exhibition of new photography), as well as skepticism from critics and photographers alike. A Google camera takes the original, menacing image, and Rickard then imbues it with his human perspective by re-framing and re-photographing. This process transforms the picture from an example of the cold surveillance of the country’s poor, forgotten quarters, to a comment on our limited perspective of these often benighted areas. The role of the artist, then, “in reasserting the significance of the human gaze within Street View, recognizes the pain and disempowerment in being declared insignificant,” wrote Rafman in Art Fag City. Seeing Rickard's photos in their full glory at the Yossi Milo gallery made it easier to glimpse the dialectic at work between the cold gaze of the machine and the artist’s human one. The first photo that stood out shows what looks to be a suburban street corner in the afternoon (somewhere in Detroit, the caption tells us). There’s a pleasing play with messiness and neatness: the convergence of sidewalks makes a cleanly-formed chevron shape — but the sidewalks themselves are cracked and patched, and space in the middle of the chevron is filled with overgrown shrubs, untrimmed grass, and rocks. In what feels almost like an afterthought, a black man stands at the crossroads, mostly in profile, his head turned slightly towards the camera, his face blurred. Though in the foreground, he looks small. Rickard’s keen eye for form is clear in one picture of a Super Fair grocery store in Chicago, the frame of which is almost entirely occupied by the horizontal stripes of paint on the building’s façade. We also see it in a shot of an empty, slightly curved parking lot between a red car wash, and a blue and white mini-mart. These careful panoramas are comfortably situated in a street photography tradition. Rickard’s photographs seemed to be especially informed by the work of Stephen Shore, whose Uncommon Places (1984) photographs of suburban and rural America display striking juxtapositions of color, tightly composed scenes, and a decidedly cool mood. Rickard can set a scene, but after viewing most of the exhibition, I started noticing what struck me as a problem: the photographs lack human drama. All three of the works described above include people situated at focal points, but you hardly notice them. In a way, they almost seem like inconveniences—blips marring Rickard’s lovely forms. The artist’s point about the dehumanizing effect of surveillance is well-taken, but it seems an impossible task to make a meaningful comment on race, poverty, and the failing American dream with photographs devoid of human empathy. For me, this is why comparisons of Rickard’s work to Walker Evans—made by Rickard himself, as well as some art publications—fall short. When you look at Evans’s Depression-era photographs of the South, you see beautifully decrepit farmhouses and dusty towns, but also portraits of people whose spirits defy the inhumanity of their surroundings. In A New American Picture, there is only one human perspective—the artist’s. There is only so much that an artist using Google Street View images has to work with when it comes to portraying humanity — beyond the fact that the original image was captured by a mechanical perspective, Google’s privacy regulations render all faces blurred. A recent work of Paolo Cirio (who calls himself a “subversive media artist”), entitled Street Ghosts, illuminates this limitation. Cirio cuts the images of people out of various Street View screenshots, enlarges them to life-size, and affixes them on outdoor surfaces where the original Street View shots were taken. In the artist’s words, his images “do not offer details, but the blurred colors and lines on the posters give a gauzy, spectral aspect to the human figures, unveiling their presence like a digital shadow haunting the real world.” Life-sized, the shots of people reveal themselves to be flat, coarse, and cold— not anything that would evoke a human response in the viewer. This is Cirio’s point: we allow Google to invade our lives with its technology, and all we have to show for it are soulless specters of ourselves. A photograph with no people in it can evoke human drama. As John Berger pointed out in his 1972 essay “Understanding a Photograph,” photography finds its meaning between the poles of absence and presence. Evans has plenty of photographs without any people in them—of an old sink in a washroom, or a barn that is falling apart. But these photos echo a living presence: you get the feeling that someone has tidied up in that washroom a few moments before Evans snapped the shot. This sense of ongoing life isn’t in Rickard’s shots—especially, and most surprisingly, in the ones that show people. In this sense, it seems that technology gets the better of Rickard. When it comes to showing the lives of his subjects, he can’t help but mimic their dehumanization, rather than challenge it. But Rickard’s works serve an important purpose apart from commenting on inequality: they test a new understanding of what Berger calls a “total view of reality” — one constructed by a corporation, ostensibly for our benefit. As Google’s Street View project expands, we should hope that artists as talented as Rickard continue to question its vision. Alexia NaderAlexia Nader is a freelance writer, researcher, and assistant editor at The Brooklyn Quarterly.